RustyRusty the dog can be found at several PADNOS locations. He guards the yards perched atop of his green dog house. 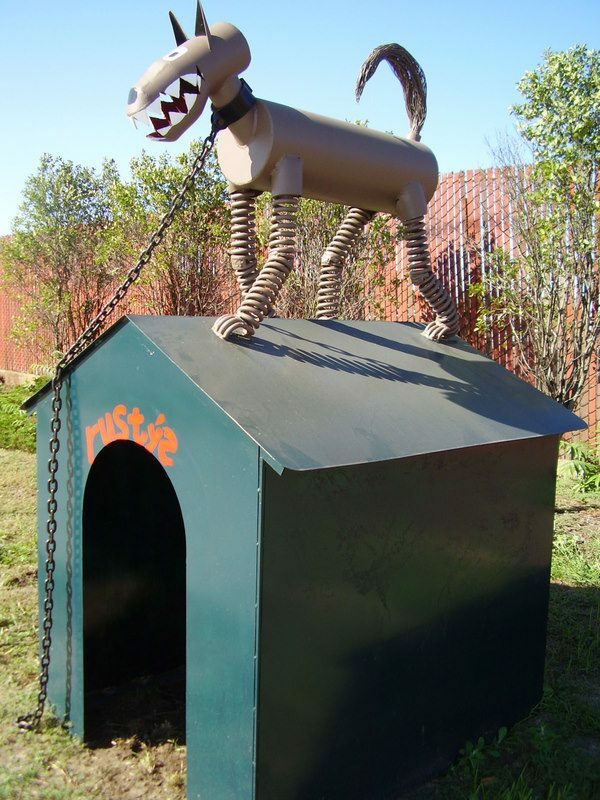 Like all of the sculptures that preceded and followed this piece, Rusty was also made from materials found at PADNOS, putting a whole new meaning to "scrap-yard dog." Children DancingIn one of Stuart's books he writes, "This is a favorite." 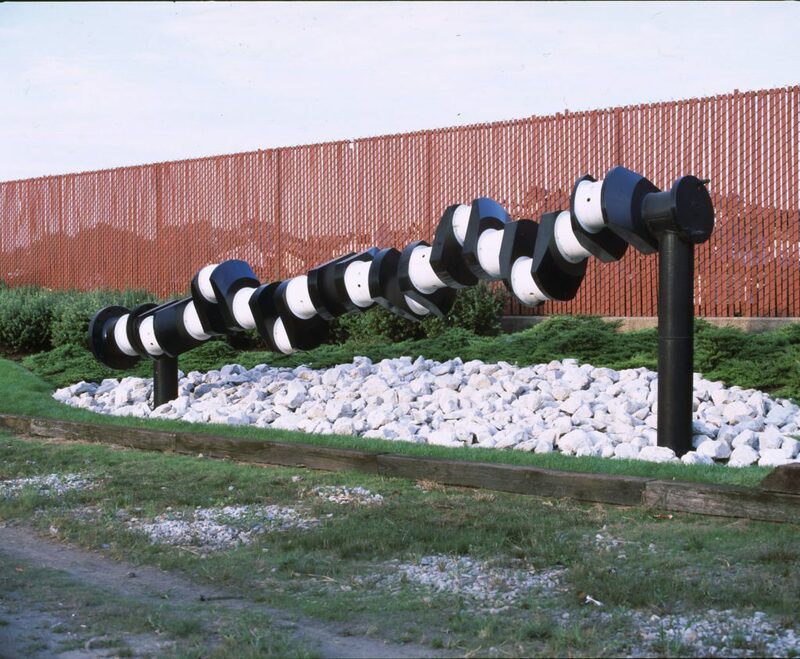 The sculpture was made primarily of square tubing cut offs. The children are painted red, white, yellow, and black to represent all of the children in the world playing and dancing together in peace. 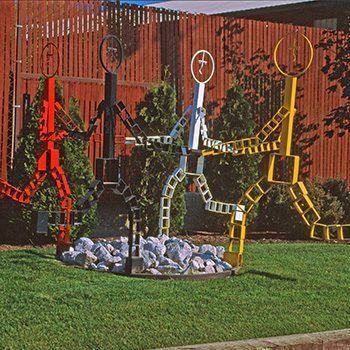 The "Children Dancing" design can be seen in multiple locations one of which is near the library at the Walker City Hall complex, and another was donated to the Boys & Girls Club. Tulip TimeWhile many of Stuart's pieces were unique he designed several Tulip arrangements. The ones shown here are made from forge shop flashing without any alterations. 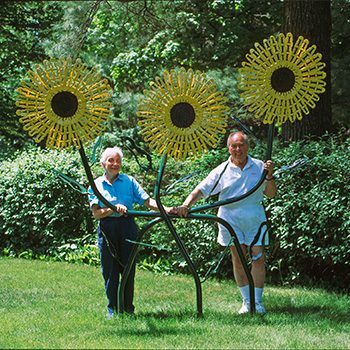 His tulip sculptures were once featured on the cover of the Garden Clubs of Michigan monthly magazine. 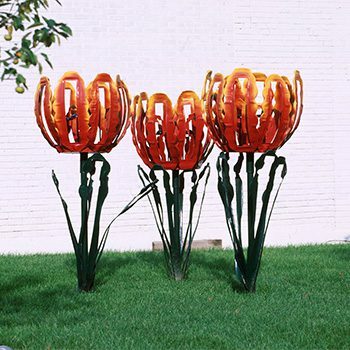 The tulips came in a variety of shapes and sizes as Stuart's pieces depended on what materials were available in the PADNOS yards. Ring out for AmericaThese large bearing races, heavy as they are, swing and turn in the wind. This piece was conceptualized on the Fourth of July and was therefore painted red, white, and blue. 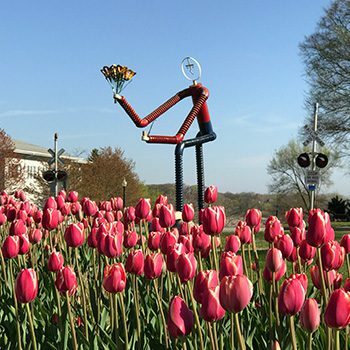 The DutchmanThe Dutchman with tulips and a pipe stands at the entrance of the Louis & Helen Transportation Center and Windmill Island. 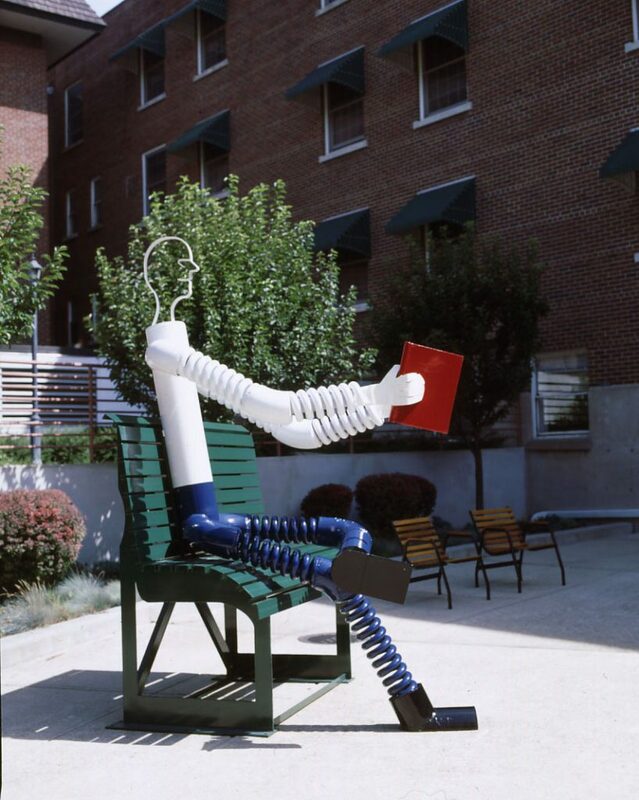 Stuart did not sell his works, but instead donated and contributed them to appropriate locations and to supporters of the arts, as he did with this piece. Metamorphosis of ScrapThe inspiration for this piece came from Stuart Padnos (1922-2012) and his memorable line, “Scrap is beautiful. 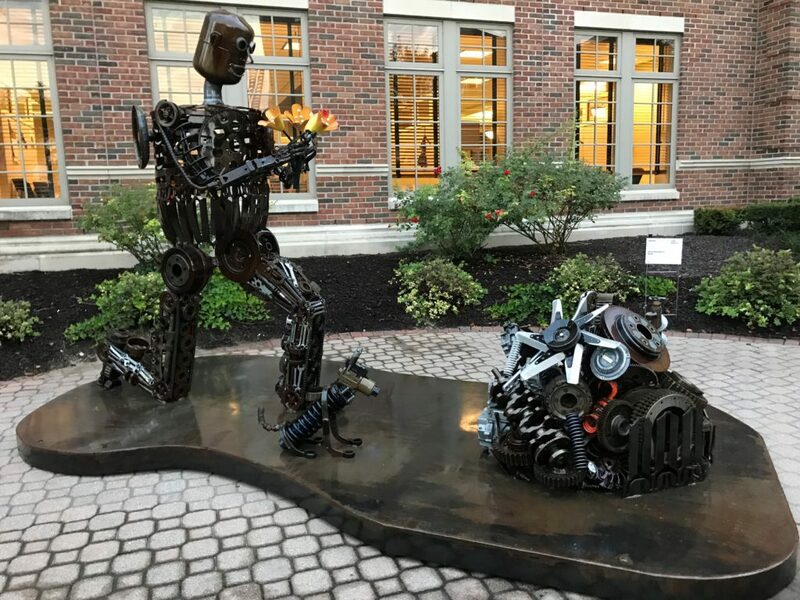 Beauty is in the eye of the beholder.” When Stuart designed the previous sculptures, he would look at the scrap and become inspired by the pieces he saw. He had an eye for potential, and saw beauty beyond the obvious in piles of scrap. The scrap man is holding tulips, one of the sculptures, that Stuart was able to see when everyone else could only see scrap. This also shows how the materials that pass through PADNOS are in the process transforming into new, reusable resources. 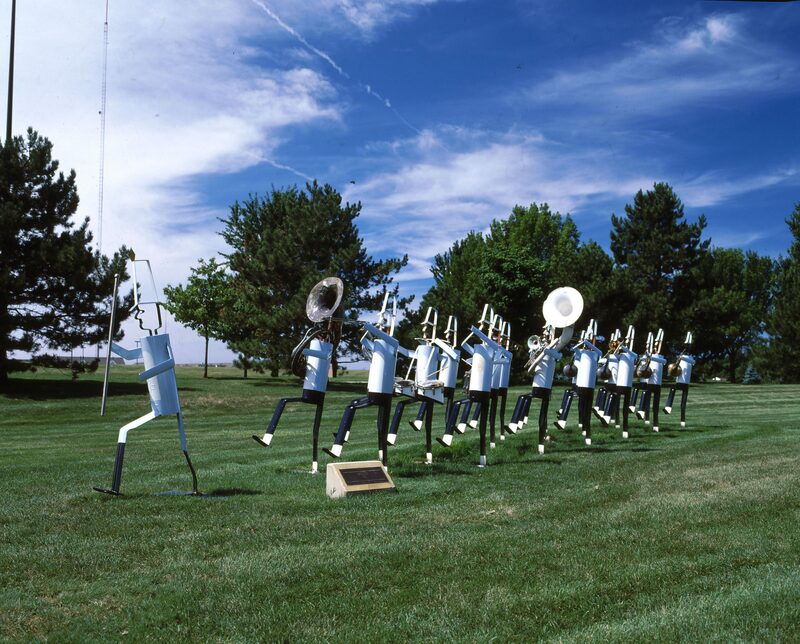 Marching Band - GVSUThe band pictured here marches across the Grand Valley State University lawn on the Allendale Campus. There have been several installments of the "Marching Band." 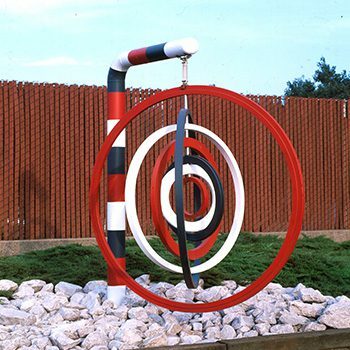 Of the three versions of this sculpture, the one located at the Frederik Meijer Sculpture Garden is particularly special in that two of the musical instruments were actually used by Fred, Lena, and Doug Meijer. The clarinet was the one that Fred Meijer played, while the trumpet was used first by Lena Meijer and, then, by their son Doug. The TeacherThis sculpture, The Teacher, was donated by Stuart Padnos to the Clark Retirement Community. Zebra Power This black and white piece weights approximately 24,000 lbs. It originally was the crankshaft in a diesel engine powering a generator in Zeeland, Michigan power plant, giving meaning to the name "Zebra Power."